COLUMBIA, Mo 7/6/15 (Op Ed) -- An Ichthus -- the "Jesus Fish" on a veterans' memorial in front of County Hall -- is offensive to some non-Christians. Should the County Commission remove it? Confederate Rock -- a boulder with a plaque on it in front of the Boone County courthouse -- offends some people for memorializing Confederate soldiers. Should we remove it? A Sid Larson mural inside the courthouse might offend with its depictions of slaves and slave owners. Now there's talk about removing it, too. In other cities, talk of removing historical monuments has reached a fever pitch. New Orleans Mayor Mitch Landrieu wants a centerpiece Robert E. Lee statue out of iconic Lee Circle. "Symbols really do matter," Landrieu said. "Symbols should reflect who we really are as a people." Are -- and were as a people. The "were" is our history, good and bad. Where does all this removing -- this scrubbing of history -- end? And does it portend a more troubling scenario: That those who forget the past are doomed to repeat it? 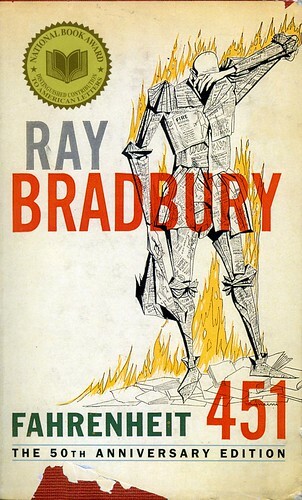 Ray Bradbury tackled those questions in Fahrenheit 451, his classic take on an authoritarian, dystopian future wherein state employees called "firemen" roam the country burning books. "Colored people don't like Little Black Sambo. Burn it," says chief fireman Captain Beatty. "White people don't feel good about Uncle Tom's Cabin. Burn it. Something's written in a book on tobacco and cancer of the lungs? The cigarette people are weeping? Burn the book." Books can offend, Beatty insists. They might spark social strife -- or merely make people unhappy. "What do we want in this country, above all?" Beatty asks. "People want to be happy, isn't that right?" To the authoritarian government for which Beatty works, keeping people happy means destroying things they don't like. Happy people, after all, are less likely to revolt. No matter how right or good it may sound, societies shouldn't scrub history off buildings, monuments, books, and other memorialized records. A society that erases its past risks not only the loss of important and informative memories, but also the danger of forgetting -- and repeating -- history's lowest days (slavery, the Holocaust, world wars, etc.). We need to remember wars; slavery; Jim Crow; and the Sharp End, Columbia's black business district lost to Urban Renewal and eminent domain. Until recently, Columbia lived with a scrubbed history of the Sharp End and the wider 168 acre Douglass School Urban Renewal area. I've worked to "unscrub" this history, taking flack from people who want it forgotten. A 2007 controversy erupted when Columbia's Historic Preservation Commission suggested naming an alley Sharp End Way. With so much of its history erased by white people who found it offensive, some thought "Sharp End" designated an area where knife fights were common. Others said sharply-dressed men and women went to church and out for the evening there. But no one knew for sure. Sharp End Way, meanwhile, never materialized. In May, city leaders erected a plaque on public property (left) to commemorate the Sharp End. Some people objected to "black people getting a special memorial" on public property. Others said it was "racially divisive". In 23 years -- the age of the 1992 Ichthus memorial -- could these arguments return with demands to remove the Sharp End plaque? Yes, especially if we set precedents removing other monuments. Finally, what about the Confederate flag? Should it fly from public places? Absolutely not. But a flag is not a book, memorial, or archived record. A flag is a signaling device. Flags are used to slow traffic, direct aircraft, mark sports penalties, signal support for sports teams, and allegiance to political systems. As a United States, we left the Confederacy behind 150 years ago. Public buildings have no business signaling allegiance to it today. Flags signal the present; memorials mark the past. I don't want to forget where I've been. I want to return to the good roads and avoid the bad. Memorials -- good, bad, even ugly (think the Arbeit Macht Frei sign that hangs over the gates of Auschwitz) are among the few things I have to mark my way.